Welcome to the Quarto’s Annual Thunderdome! 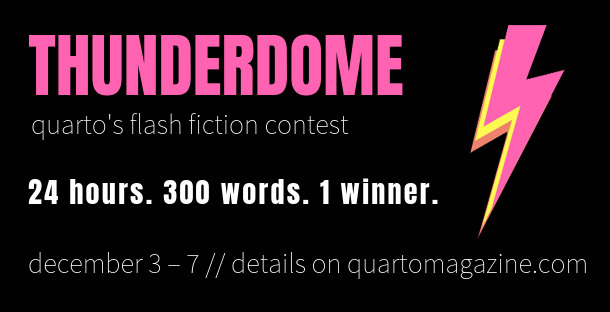 Join us for a five-day flash fiction writing contest starting Monday, December 3rd! Note: Only Columbia University undergraduates may participate in this contest. For the first day, Monday, we have Creative Writing and Ethnicity and Race professor Deborah Paredez with her prompt. Click here. For the second day, Tuesday, we have Philosophy Professor Achille Varzi with his prompt. Click here. For the third day, Wednesday, we have Electrical Engineering Professor David Vallancourt with his prompt. Click here. For the fourth day, Thursday, we have Emergency Medicine and Comparative Literature Professor Rishi Goyal with his prompt. Click here. For the fifth day, Friday, we have English Professor Margaret Vandenburg with her prompt. Click here.